1. How long have you been in the surface pattern business? I started in 1988 when I worked for a textile printer before going to college to study textile design. At the printers I worked the costumes for THE LAST EMPORER film and fabrics for Paul Smith, BodyMap and Artwork. I specialized in woven design at College and was lucky enough to get an internship at an Italian mill just outside Florence where I worked with the designer initially teaching him English and then working on the mill’s collection for Paul Smith (again) Jean Paul Gaultier and Emporio Armani. 2. How did the collective start? When I left Italy to set up my studio I went back to London and was lucky enough to get free office space with the fashion company OASIS. (a big British Womans-wear chain) I got free rent in exchange for free design work. It was a fantastic learning curve. They’d give me their colour palettes and I’d design them 50 – 100 colour-ways for each design (I’m a lot more selective now) I also worked for Jean companies – like Levi Stauss, Pepe and Dockers. I teamed up with my friends Michael and Issy at Peagreen and we started showing at PV in Paris. I sold a load of designs to Calvin Klein for underwear who then asked me to design a whole range to sit with the designs they had bought.It was amazing I’d sold 10 desigs the first show which paid for the show and a little more and then CK turn up and buy 30 designs in one go. I nearly fell off my chair. We all started going to New York after that and now we divide our time doing shows in Paris, New York and Frankfurt. And designing specific collections for people. 3. Do you work from personal points of inspiration or follow trend watching sites? I do both.I keep an eye on trend but don’t really follow it. I look at magazines- all sorts, fashion, music, interior, food. I love Music, Films, Comics – POP culture in general. But my main inspiration is color. So I look at everything and the color usually filters through. 4. If you use trend watching sites for color or motif ideas would you please list your favorite sources? 5. Anything else you would like to share with Maquette readers about you, your designs, etc. 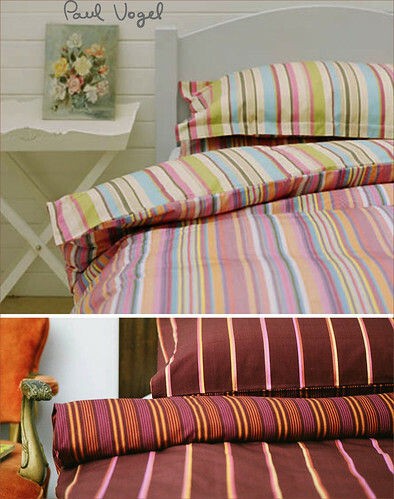 We have designed a range of bedlinen that we are adding other home products to. www.paulvogelbedlinen.com , you can follow us on facebook as well. I will look forward to meeting you at Printsource Paul!